Not one of us, Merlin and Benjamin Button excluded, are getting younger. Time, the world tells us, is of the essence. This is true whether you are trying to get that army onto the table to play or your masterpiece finished so you can move on to the next. When I paint a miniature I usually begin with the larger areas such as skin and clothes before moving on to the details such as weapons and equipment. The same progression occurs when blending. Start with the large changes first, using opaque colors to set your shades and highlights. Then, as you start blending add more and more medium to your paint. This way you get your highlights positioned properly before you start futzing around and avoid having to paint a million layers of essentially transparent paint to make a small adjustment. I call this lean over fat, after the oil painting axiom of fat over lean to avoid cracking. This is where each layer needs more oil than the previous so that the outer layer dries slower and won’t crack. The benefits of this technique is the speed and accuracy with which you can render your blends. Your highlights and shades are exactly where you want them, applied first so you can judge contrast and consistency over the entire model, and then blended together without worrying another them slowly creeping as can happen when just use glazes to build the colours. 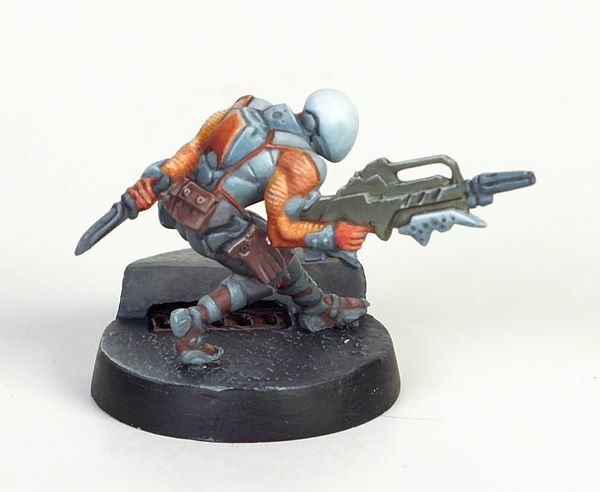 This is how I painted my Infinity miniatures, both the painstakingly painted Zero and the rushed “Oh yeah, I was supposed to paint these quickly for the table” Intruder. Both styles of painting benefited from this technique. Not only because it let me paint them at a higher level but it noticeably sped up the process. I can’t wait to paint my Knight Models Boushh miniature using this technique. Do you paint this way or do you prefer to slowly build up colour? Give me your blending technique in the comments. You can also reach me on Google+ and Twitter. I’m also looking for guest posts so if you are interested drop me a line. Then Subscribe to see your name in print. I don’t get to paint much anymore, but apparently I still have some skills. I have a very old school style, so layer highlights, and thinned washes generally over the black basecoat. I like to try out new techniques and product though, I experiment with a grey basecoat. I quite like the wet palette but if you’re painting for speed or bulk or just want the GW method, you go black basecoat and I guess there high pigment paints. I prefer their layer paints and other paint lines. I quite like the Foundry triad paints, but I usually throw in one more lighter highlight to really make things pop. I don’t really try to paint better, I’m more interested in painting more efficiently as I just have so little time for the hobby these last few years. Some good points there Muskie. You’re right about painting better is often secondary to painting faster. I always try to consider that in these micro tutorials. I actually don’t use washes because I don’t like how long they take to dry. My preferred speedpaint is to slap on a quick basecoat without worrying over-much about coverage, paint in shadows, paint in highlights and put a second coat on the mids to clean it all up. If there’s a big area of shadow with little bits of mid, for example, I’ll paint the whole area in shadow and come back and pick out the mids. This way everything gets 2 coats for coverage but it’s much faster than painting 2 coats of base over everything, then washing, waiting for it to dry, and then highlighting. 2) Natural light and shadows will blend your transitions for you. When I assembled my first CB mini it was eye opening. I had only ever painted games workshop minis and thought I had good painting skills. The detail and scale of the infinity models has made me realise how far I have to go! It is great to have a challenge like this, to go from table top standard to display. The other realisation was that by only painting cartoon style marines, etc, I didn’t really have a great grasp on good techniques. It relied only on washes. While all well and fine, it doesn’t get the results I want to achieve. That zero above is something I want to shoot for. Thank you for the tips you gave, it will require some perseverance, but I’ll get there in the end. Thanks for the kind words Smoke88. That Zero was one of those miniatures that just comes out better than normal. It’s like a rare flash of what I’d be able to paint like in a year. I’m working on a lighting rig to start making more painting videos and also take some good WIP shots for full tutorials here. Let me know if you have any specific questions or want to share your work for advice. I would love a critique of the painting I have been able to do. What is the best way to get the pics to you? I am not a technophobe, but have to admit to not being terribly savvy with computers! I would appreciate some pointers if you have the time, that would be wonderful. Charles, there are a number of easy ways to share files. If you have a google account you already have a Drive account. You can upload images there and share them with me. You can also share them privately (or publically) on Google+ with me. There’s also Dropbox. You can also simply email them to me if they’re not too large. Coyotebd@gmail.com. Hey, this is not a technique I’ve encountered before, are there any videos you can recommend so I can see it in action?